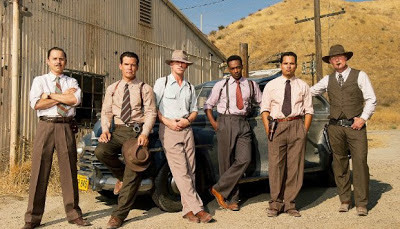 Gangster Squad is the story of a group of the toughest cops in L.A. who dispensed justice without their badges on and fought to keep East Coast Mafia types out of Los Angeles in the 1940s and 50s. It was to have been released in September, but Warner Bros. decided against releasing film with an explosive cinema shootout/massacre just a couple of months after the Aurora, Colorado shootings and there was some frantic reshoots and editing required to deliver a finished product. The performances from Josh Brolin as dedicated squad leader Sgt. John O'Mara and Emma Stone as sultry Grace Faraday, moll to crime boss Micky Cohen were above their average. Sean Penn [Cohen] seemed to relish in his slightly over the top villain and despite the fact I despise Penn himself, his performance was faultless despite his distracting make up. Ryan Gosling however perplexed us with an extraordinarily effeminate whiny voice for his Jerry Wooters that did not sound convincing whatsoever and while Robert Patrick may be getting on a bit alright he’s not old enough to be playing Max Kennard a role that would have better suited Sam Elliot 10 years ago. I was also left wondering how many of the people in the audience would have even recognised the once great Nick Nolte playing legendary LAPD chief William H. Parker? I really wish I could have seen the original cut because I think I'd be here singing Gangster Squads praises in a longer, better review than I can write about this. I think what we got has the makings of a masterpiece that would sit on a shelf just beneath L.A. Confidential and The Departed but the changes made literally castrated the film. As it stands now, it’s fair to good rather than the excellence it exudes from its best moments. Sadly now there’s as much wind in my sails about it as I assumed was in Ruben Zombieland Fleischer's as he signed off on the final deeply flawed cut. It’s easy to see where the movie was altered from the multitude of glaring plot holes that manifested themselves in the last 40 minutes or so with characters apparently developing both powers of deduction and psychic abilities not out of place in a superhero flick. I'm unsure if it was due to these changes the made it seem like the Gangster Squad was basically running about without a cohesive operational plan or what the O'Mara/Wooters friendship didn't seem to be in any way genuine, but I guess we'll never know. Final Verdict: It’s a cinematic tragedy that this felt like a 4.5/5-Star movie that had to be butchered down to 3. As such Gangster Squad deserves to be listed as one of those wounded in the Colorado shooting.